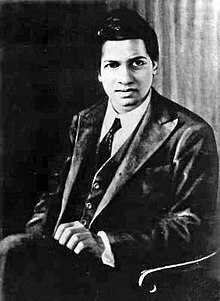 Srinivasa Ramanujan Iyengar (December 22, 1887 – April 26, 1920) was an Indian mathematician. He is considered to be one of the most talented mathematicians in recent history. He had no formal training in mathematics. However, he has made a large contribution to number theory, infinite series and continued fractions. He was mentored by G. H. Hardy in the early 1910s. After getting his degree at Cambridge, Ramanujan did his own work. He compiled over 3500 identities and equations in his life. Some of the identities were found in his "lost notebook". When the notebook was discovered, mathematicians proved almost all of Ramanujan's work. His discoveries have led to many advancements in mathematics. His formulas are now being used in crystallography and string theory. In 2011, Ramanujan's birthday was made an annual "National Mathematics Day" by Prime Minister Manmohan singh. This page was last changed on 16 January 2019, at 15:55.